ri Lankan national cricket team member Dhananjaya de Silva’s father, Dehiwala-Mount Lavinia Municipal Councillor (SLPP) Ranjan de Silva allies ‘Mahathun’ (62) has been shot dead by unidentified gunmen in Ratmalana, Thursday evening. 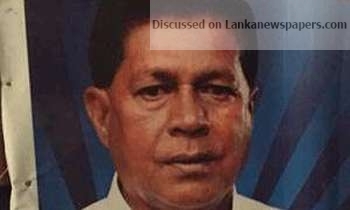 He was the also the father of fmr SLPP Dehiwala-Mt Lavinia Councillor Savithra de Silva. Initial police investigations revealed that the victim was shot at in Gnanendra Road (Sea Beach Road), Ratmalana close to his resident at around 8.30 pm. Two other individuals who received injuries due to the shooting, were also admitted to the Kalubowila Teaching Hospital.